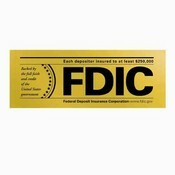 Mylar emblems provide quick customer identification of your institution as a member of FDIC. Pressure senstive self-adhesive labels can be applied to doors or windows in seconds. Decal visible from both sides. Black letters on gold. Size: 3" x 7".